Get all the tools you need to deliver compelling ServSafe Alcohol training sessions. The Instructor Toolkit is designed to be a flexible, comprehensive resource with information and ideas that will help you teach a ServSafe Alcohol: Fundamentals of Responsible Alcohol Service class effectively. 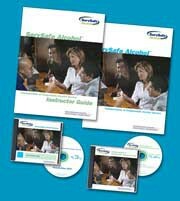 Toolkit Includes: # Fundamentals of Responsible Alcohol Service Instructor Guide # Five DVD Set - includes one DVD of each individual title # Also includes a ServSafe lapel pin.